Wattstopper Occupancy sensor in ivory color, features ultrasonic technology. 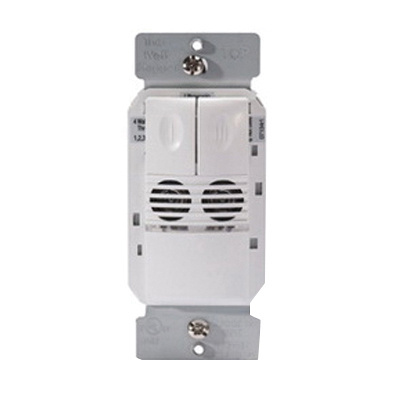 It has small motion detection of 15-ft x 15-ft and large motion detection of up to 20-ft x 20 ft. Dual relay sensor requires 120/277-Volt AC voltage for operation. It is suitable for applications where the sensor may have a partially obstructed line of sight of the occupant. It has a dimension of 2.73-Inch x 1.76-Inch x 1.83-Inch. Sensor with DIP switch, has response time of 5 - 30 mins. It is wall mountable. It incorporates selectable operation, walk-through, test and presentation modes to ensure better energy savings. Sensor is UL/cUL listed and meets NEMA standards.